University of California and California State University campuses’ “core funds” are directly derived from California property tax and a state revenue that has been witnessing all-time lows since 2008. The admission rate of out-of-state students has risen over the years, with non-resident tuition more than $9,000 more than that of California residents. “We live in a world where the amount of non-resident students who [universities] bring in is meant to balance out overall enrollment,” said UC Santa Cruz director of admissions Mike McCawley. 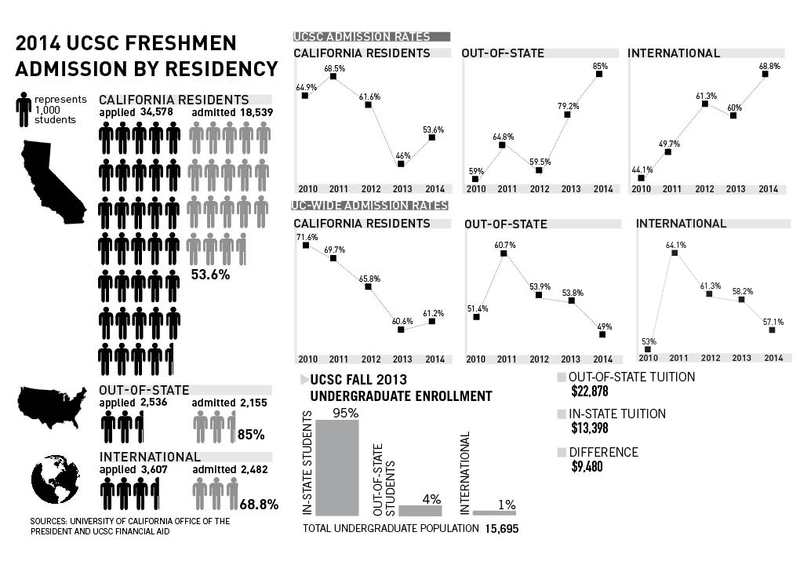 At UCSC alone, 388 non-resident students were enrolled for the last fall quarter. This is the highest admittance of non-residents since 2007-08, when 383 non-resident students were admitted. UCSC director of institutional research and policy studies Julian Fernald expects non-resident enrollees to continue on an upward trend into next year. “You can see the number has gone up recently, but last year was not higher than it was seven years ago. Next year we expect it to go up significantly to roughly 750 plus,” Fernald said.